Historic railmotor trips operate every Sunday except Christmas Day to the following timetable. Tickets are available from the station on the day. Please note: Where * is displayed, station is a Request Stop. Musk station times are within 1 minute of Passing Clouds. 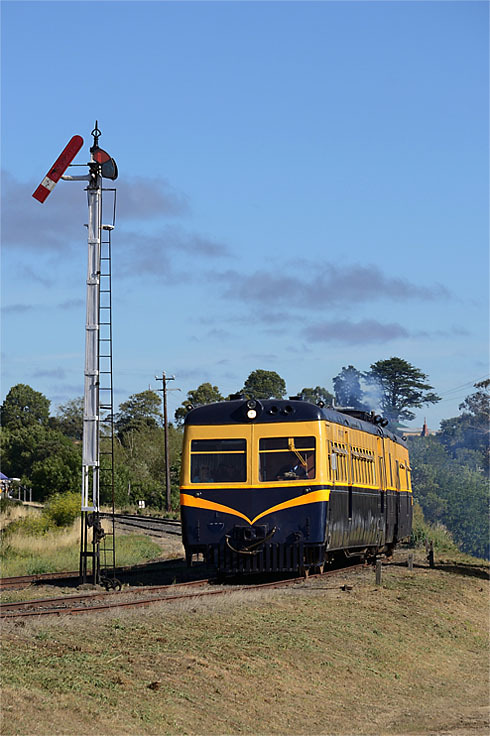 Historic railmotor trips will be operating to an expanded timetable on Sunday 10 March 2019. Tickets are available from the station on the day. 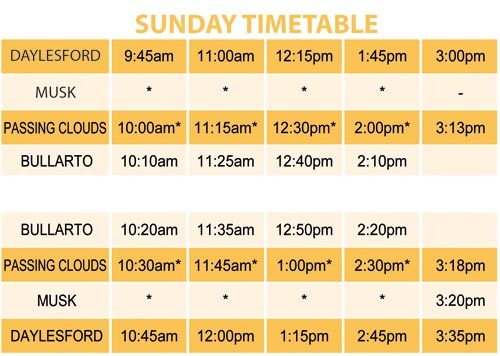 Seating is non-reserved and train tickets are available on the day from the ticket office at Daylesford railway station. We recommend arriving at least 15 minutes prior to departure. For the Rail, Wine and Dine package on Sundays, please book through the Passing Clouds winery. Ph (03) 5348 5550. Trains will not operate on days declared as Code Red fire danger. Timetable effective as from 22 July 2018.